I am still finding sand – a small oasis in a pair of sneakers, a wayward grain or two in the bottom of a messenger bag, enough for a zen garden in the trunk of my car – weeks after we wrapped principle photography on The Other Side. Back in June, ReKon Productions joined forces with the team at City West Productions to produce the short film, The Other Side. Written and Directed by Scott Brown (MyDomain) the story is about a couple carrying out a simple job in the desert when things go awry. With the main location being the desert, it was not surprising that I found myself out in Lake Los Angeles for two days of shooting. For those who are not familiar, Lake Los Angeles is a gorgeously (though slightly sparse in population) desert place located between Lancaster and Palmdale that has been used by filmmakers since 1938. It is the picture perfect landscape what with the mountains, and the joshua trees, and even the occasional tumbleweed. Filmmakers love the majesty and cinematic perfection, but even the most seasoned and passionate of crews cannot escape the perils of shooting in a desert. PERIL [per-uh l] noun. – exposure to injure, loss, or destruction; grave risk; jeopardy; danger. There are these long endless stretches of roads in Lake Los Angeles, that have an intersection every four miles or so. All the intersections have this confusing ability to look exactly the same, from whatever direction. I spent a couple of miles at least three intersections, convinced I had been distracted by the sunrise enough to completely miss my turn. 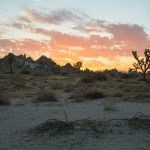 I wasn’t and didn’t miss it; a white washed sign sitting at the base of a beautiful joshua tree pointed me to base camp. tive shade of a pop up tent and I was ready. Joining our 2nd AD, we hopped into a car and began our drive to set. The problem with the desert and GPS is two folded – there are no addresses and the internet/ cell reception is shoddy at best. So even with a ping of their location from our 1st AD, it was impossible to figure out how to get to the dot on the map without any real roads. 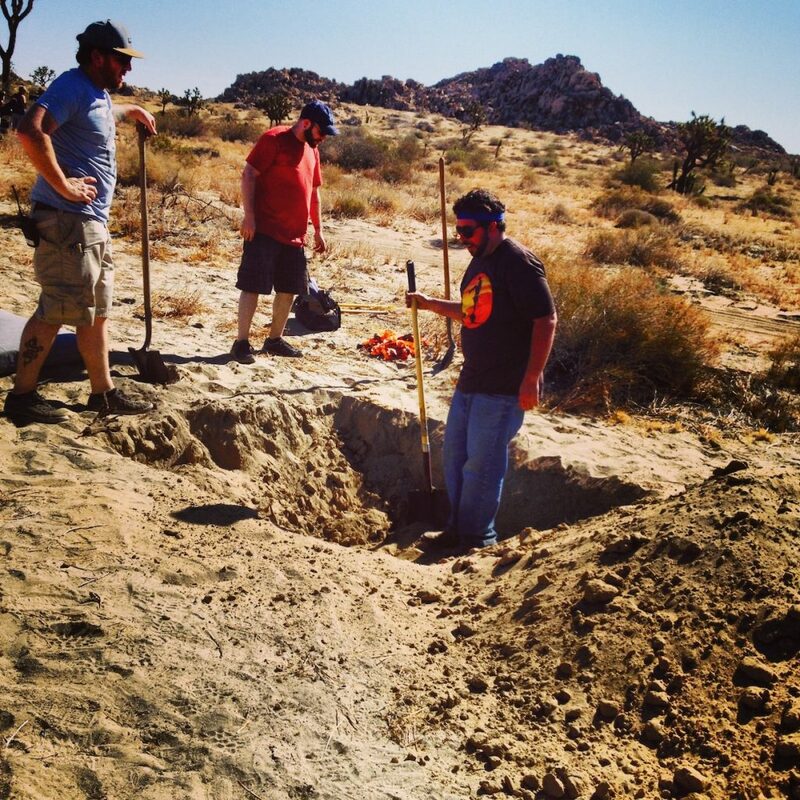 After about ten minutes of driving with three people scanning the mounds of sand and around rock formations for the obvious set up of a film crew – we called the 1st AD. Another five minutes on the phone before set sent out a search party for us. Twenty two minutes after leaving base camp, we arrived on set. PERIL # 2: EXPOSURE to INJURY. Our first big action sequence for the day was staged right over a very industrious red ant colony. It was maybe two takes before the ants made their displeasure at our intrusion into their home clear. Our actresses were their first (and repeated) victims. But the ants didn’t discriminate, they attacked anyone who dared walk within the radius of their home. A red ant bite, as described by our unfortunate intern, starts with a numbing pain that falsely makes a person think their leg is asleep. Then your ankle (where the ant struck) swells up to three times it’s size and the burning sensation begins. They are called fire ants for a reason. But it isn’t anything a dose of benadryl and some water couldn’t fix. It’s mid-afternoon- and you’ve been under the blazing sun for two days, and you have a not so thin layer of sand covering every inch of your body and you couldn’t possibly drink another water bottle – when you decide to drive a 1-ton truck down to set. It’s a harmless decision, one made on a daily (if not hourly) basis on any set. 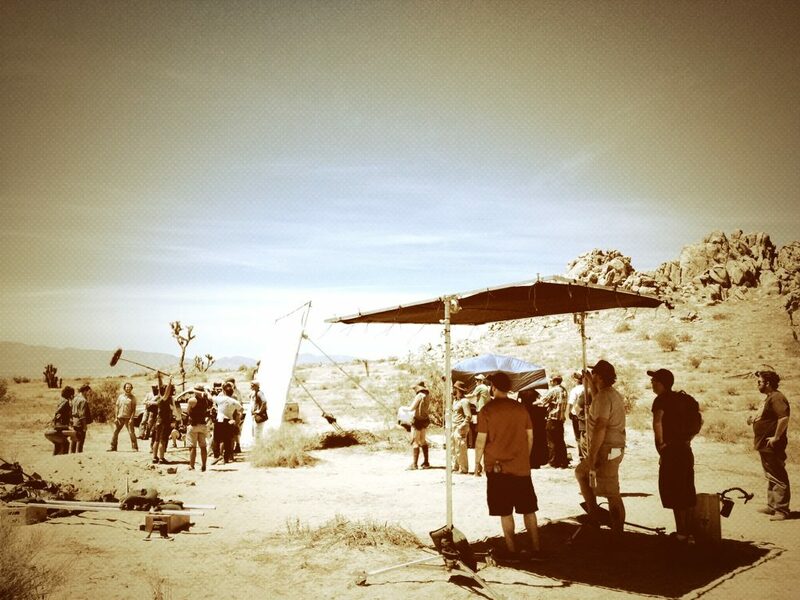 The problem with this decision on this eve on this set – is that we are in the desert. The desert where the sand is soft – and uninhibited by cars. The one ton truck gets stuck. Not just a little stuck, but like back wheels have sunk their lower halves into the home of our neighboring red ant colonies. Several members of the crew try, to no avail, to push the truck out. Coax it with ropes and help from a friend (a well equipped pick up truck). But the our one ton will not budge. The sun starts setting and we call for the tow truck. The first stars shine brightly when the tow truck arrives. The first stars are still the only ones out when the tow truck refuses to drive into the uninhibited sand of the desert to rescue our one ton. Our one ton truck spends a quiet and undisturbed evening under the stars. PERIL # 4: GRAVE RISK. Maybe not what the definition meant. But it is a grave and remember the red ants? Yeah, danger. The nearest Starbucks was 13 miles away from set – ONE WAY. Gusts of wind are dangerous. It’s a fact I’ve always vaguely known – as a memory of a broken pop up tent come to mind as it flew across a parking lot and luckily hit no one and nothing. But gusts of wind in a desert – where there are little to no structures (man-made or natural) to block the increased wind speed become increasingly more dangerous. A gust of wind can send a sand storm right into your eyes. Or scarily shake a silk screen enough to immediately mobilize an entire army of Production Assistants to move our entire stock of sand bags onto the base of it. The irony of sand bags in the desert was not lost. Despite the mother nature’s best efforts against us, we crossed the desert (with actors, cameras, silk screens, and trucks) and came out The Other Side victorious.